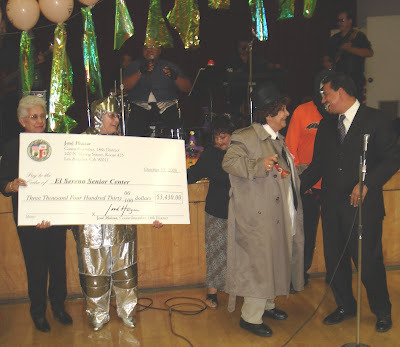 On Thursday, I attended the El Sereno Senior Citizen Center annual Halloween luncheon and dance to present the group with a $3,420 check to replace some items stolen or damaged following a couple of break-ins in August. There were about 150 people in attendance, many in colorful and creative costumes to mark the holiday. Their spirits were pretty high already, but they absolutely soared when we announced that the money was going to purchase a new television set, a DVD/VCR unit and some couches and chairs. It was important to remind these seniors who have done so much to make the rest of our lives easier that the thoughtless actions of a few do not represent the feelings of so many others. We respect our seniors and we want them to be comfortable and hopefully these new items will help. I have to say that a few seniors got me out on the dance floor and showed me that they are still young and vibrant at heart. It was a lot of fun and we’ll do it again at the annual Senior Snowball in December!